Funny, the first time I heard of a “manager readme” my reflex reaction was “sounds self-important”. Then I read a dozen or so examples and realized this document has nothing to do with ego but entirely about establishing relationships. It’s for you, the reader, who is likely a new colleague, and I want us to be successful. This document is to help you better understand me and our new relationship. My primary role is to make everyone around me be successful. When you are quickly and consistently achieving your goals, and delivering value to our customers, you are contributing to the success of the department, the company, and me. When everyone around me is winning, I am winning. At the core of successful business is a nervous system linking all the functions together. Department heads act like the peripheral nervous systems, which are connected to the central nervous system of the company. My job is to learn and sense everything going on and transmit communication impulses to the appropriate receptors. My values hierarchy is: (1) person, (2) team, (3) company. This means I’ll prioritize your happiness over the health of the team (truthfully, if you’re not happy you’re likely harming the team anyway). If you’re not enjoying being part of a team I’ll spend time supporting you and finding somewhere else in the company that is a better fit. If this company isn’t for you and you want to leave I will help you find an amazing job at a different company. People first. A title is not for influence or power. I believe that leadership and influence are available at all levels. Your ability to lead is independent of your role is or how many people report to you. We all learn more by listening than talking. It is better to remain silent and appear stupid than open your mouth and remove all doubt. 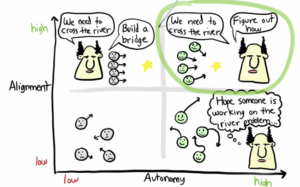 Erik Kniberg beautifully summarized how alignment affords autonomy and great teams. Autonomous teams are the keystone of high performing companies. When teams are in a high performing state I firmly believe in the “Trust and Verify” model. I am an early riser and am often in the office by 8am. I like to pick my kids up from school around 5pm so will often leave at 4:30. I’ll usually be back online around 5:30. It’s not unusual for me to respond to Slack and email in the evenings and weeks. That doesn’t mean I expect you to do this. It’s just my way of keeping my head empty – I hate having tasks in my cognitive TODO column. I go to a lot of meetings. It’s part of the job and not because I have some deep masochistic love of meetings. Don’t create meetings unless they’re truly necessary. All meetings should have an understood, perhaps explicitly stated, purpose and agenda. When the purpose of the meeting has been met the organizer should close the meeting. Filling timeboxes to fit the scheduled time is waste. Be on time and finish on time (or early). Don’t ask me for permission to take time off. I’ll always tell you to ask the team and then tell me (and fill out the Vacation Calendar). When you go on vacation you should be off. If you don’t believe this is possible there’s an organizational problem. We should fix that. Set your own goals and work on them. I’ll encourage and support your journey. But is is your journey. I’m a 1:1 zealot. At minimum we’ll have them every other week for 30 mins. We can increase frequency and length if you like. 1:1s are how I learn what is really going on in your life, your team and our company. You own the 1:1. The calendar invite is editable by you. You can change it whenever you want. If you or I find ourselves dreading 1:1s something is wrong with our relationship. We should work together to identify what and fix it. Take advance time to think about topics and what we should talk about. I have created a private Slack channel between us, specifically for 1:1 topics and notes. I test as an extrovert because I get energy from being around people. However, my Britishness makes me quiet in large groups especially when there is a lot of conversation. I find it difficult to interrupt or talk over people because it’s ingrained into me that this is rude. Stating opinions as facts pisses me off. Asking for a title to anoint the power to influence, or worse tell, other humans what to do really pisses me off. Shooting down colleagues or throwing people under the bus really really pisses me off. I like to go running at lunchtimes. It gives me time to meditate and energy for the afternoon. Where to focus on your first 90 days?